Austin, Texas is becoming a very popular biking community for a variety or reasons. For one, it was selected by Money Magazine as the #2 best big city to live in. The University of Texas and its array of cultural and other activities is perhaps the biggest draw for Austin, its cosmopolitan and high-tech, quirky soul is another reason. UT is just one of 9 colleges and professional schools in the area. The area is a hotbed of semiconductor and software industries. 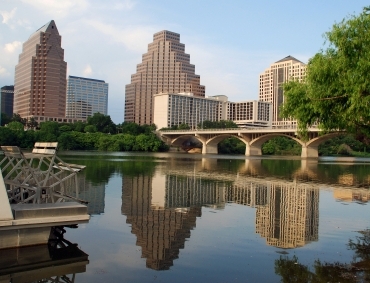 Austin, with a population of a 758,000 is large, but not so big that it is overwhelming. The city bills itself as quirky and fun. Residents will not only find plenty to do in the live music capital of the world which has an extremely robust cultural scene. 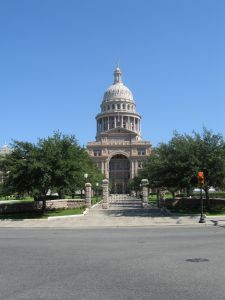 Local attractions are many, ranging from the state capitol to the LBJ Library and Museum. There are many public golf courses, including the oldest in the state – the Hancock Golf Course. There are bike lanes and places to go on road trips. Photo of 6th St. by Larry D. Moore courtesy of Wikipedia and (CC used under a Creative Commons ShareAlike License. People moving to Austin will find every kind of housing choice – from active adult communities to all types of housing in the city’s neighborhoods (see link to Active Adult Communities at top right). From apartments to condos to houses, the area offers very good value and is a reason why Austin is one of the fastest growing metros in the U.S. Neighborhoods in the west going into the Hill Country are very desirable, as are many of those near the campus. The real estate market has been stable even as it went down elsewhere in the country. The National Association of Realtors reports the median home price to be $310,400 in Austin-Round Rock area during the 4th quarter of 2018. Austin is in south central Texas in an area that separates the Texas Hill Country from the prairies to the east. The Colorado River flows across the Balcones Escarpment here; in fact the River goes right through the center of the town. The average July high temperature is 95 and the average January low is 40 . May is the wettest month (5"). Austin is a cultural feast. The University of Texas is a cultural engine, but the local art world is very active with many museums, galleries, open air art markets. It bills itself as the Live Music capital of the world. There are 3 downtown performing arts theatres including the Paramount Theatre and Zachary Scott Theatre Center. Residents enjoy the Blanton Museum of Art, the Bob Bullock Texas State History Museum, the Austin Museum of Art (AMOA), and galleries at the Harry Ransom Center. Ballet, opera, and a good library system add more. Osher Lifelong Learning Institute from UT. As is typical in a larger city, the crime rate is above average. As is befitting a university town, health care here is topnotch. There are 12 major hospitals in the area. Austin-Bergstrom International Airport. Amtrak offers service to points east and west. Austin is rated as one of the 10 best bicycling cities in the U.S. Capitol Metro, which offers free fares to seniors 65 and over. City transportation service allows seniors to book rides to appointments for $3.00 each way, Monday through Friday.